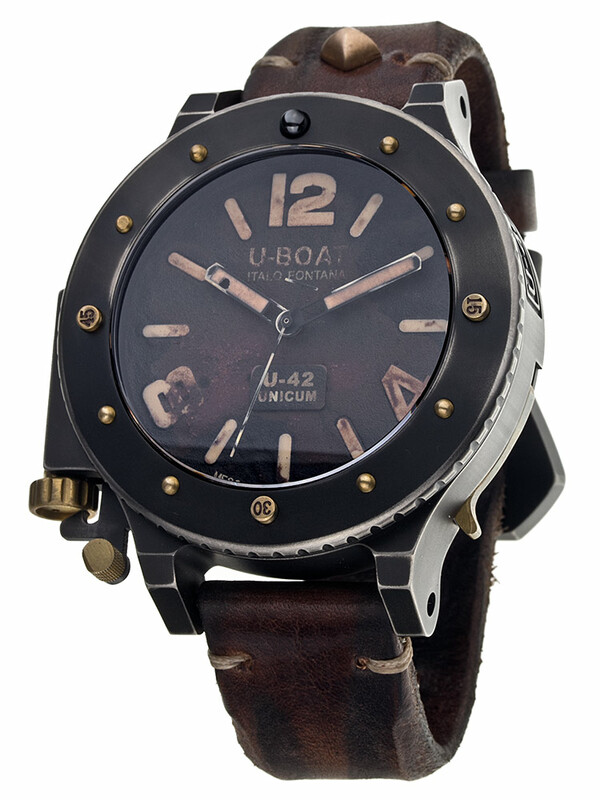 U-Boat U-42 Unicum 8088 Editio Secunda Titanium - Bronze 53 mm Autom. MOVEMENT: automatic mechanical modified and personalized at U-Boat specifications with stem position at 9 o’clock. Freqüncy: 28.800 vibrations per hour, 4 Hz. Power reserve: 40 hours. 25 jewels. Height: 4,60 mm. FUNCTIONS: hours, minutes, seconds. CASE: in titanium, with subseqünt treatment of IP Black coating. Crown, pin of the hook, screws on the bezel, bezel release lever, limited serial numbering case plate in bronze. Bidirectional rotating bezel in titanium lockable with a lever on the right side of the case. 12 o’clock ball indicator on the bezel made of ceramic. 53 mm diameter. BACK: in titanium fixed on case with 6 encapsulated hexagon screws in steel, serial number engraved by [Weiterlesen...] hand on the back case. DIAL: mat black, markers treated with superluminova (peach color). Baton hands, treated with superluminova. The dial, the case and the hands are refinished by hand using the traditional artisanal techniqüs. This handmade techniqü renders each U-Boat UNICUM, different and one of its kind. CRYSTAL: sapphire glass. WATER RESISTANCE: 300 mt, 30 ATM. STRAP: hand made and hand finished calf leather, carefully selected and processed following the traditional artisan handcrafted techniqüs, which give the strap a naturally distressed feel and look. Buckle in titanium, with subseqünt coating PVD opaqü black and tongü in bronze.